Cheesecake is not something that I usually think of as being "thrifty", to buy or to make. I must have had cheesecake on the brain because my pinterest page has about 5 or 6 recipes that I have added in the last few weeks. I took advantage of a sale on cream cheese this week at $1.19 a package. 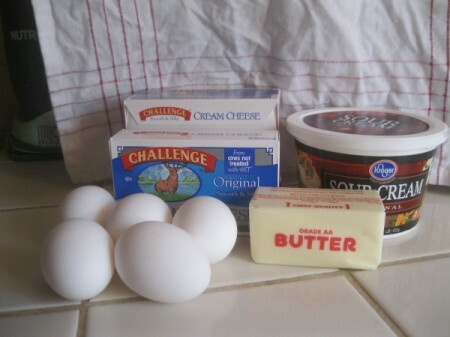 When I calculated the ingredients cost, this was less than $8 to make! 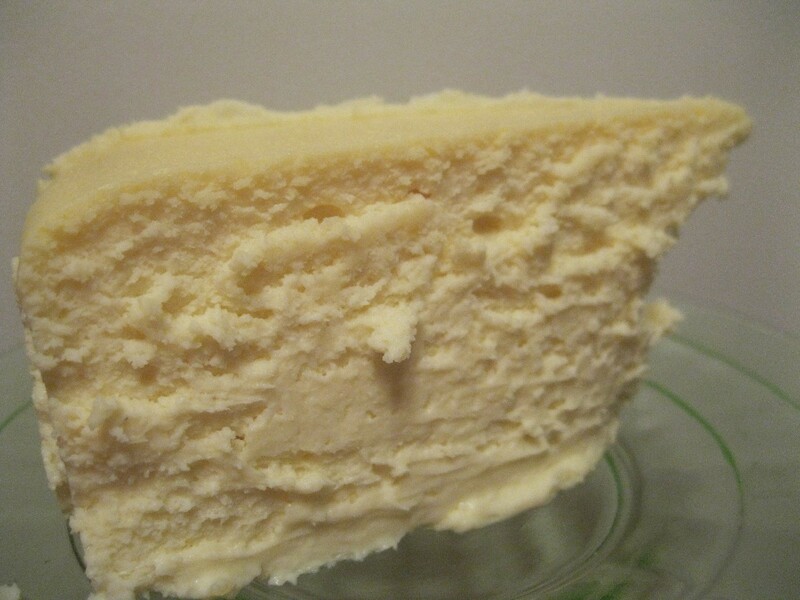 It is one of the best cheesecakes I have ever tasted. It is so creamy and smooth. There is no graham cracker crust, but you could make one if that is what you prefer. I could have gone either way. I made a strawberry sauce to go over the cheesecake, but it didn't need it. It was perfect the way it was. It was well worth the effort. 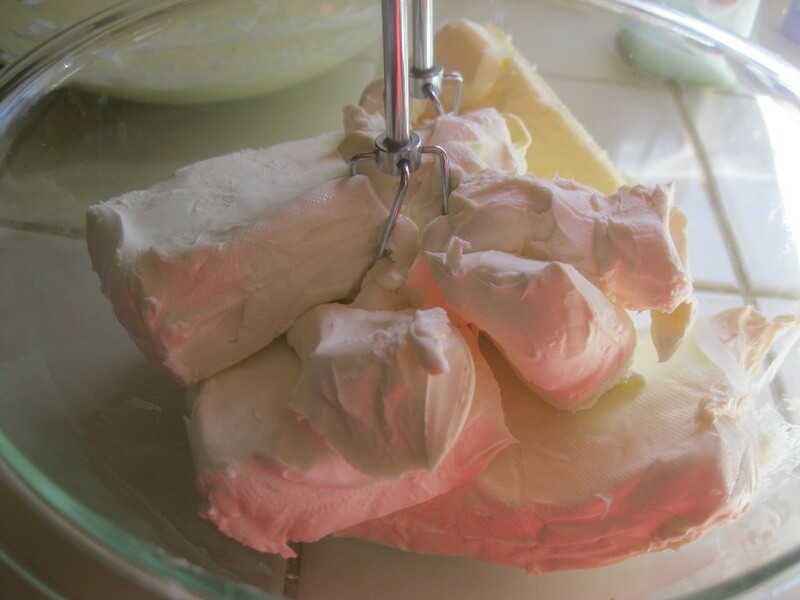 I will definitely be making this again, when I can find another great deal on cream cheese. Total Time: Over 6 hours before you even get it in the fridge. Then it sits in the fridge overnight. Plan ahead! Yield: Depends on your portion size...probably 16 servings. Source: Jim Fobel's "Old Fashioned Baking Book"
Generously butter the inside of a 10 inch springform pan. (I only had a 9 inch pan, but I baked according to the directions and it still came out perfect). Wrap a double layer of aluminum foil tightly around the outside bottom and sides of the pan. 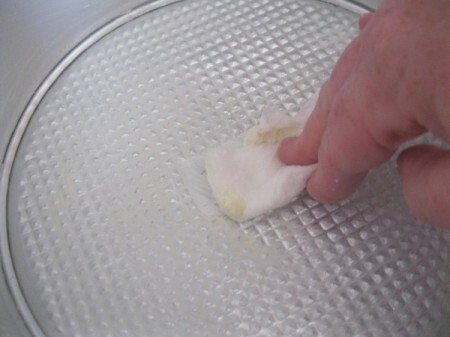 You don't want water to seep into your pan while it's in the water bath. Put your baking rack in the center of the oven. 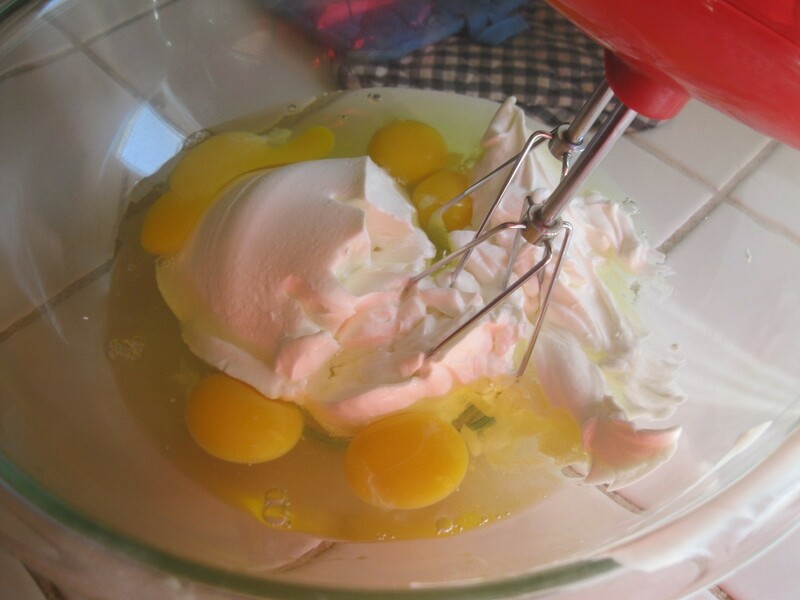 Preheat oven to 300 degrees F.
In a large mixing bowl, beat the eggs and sour cream with an electric mixer, until well blended. 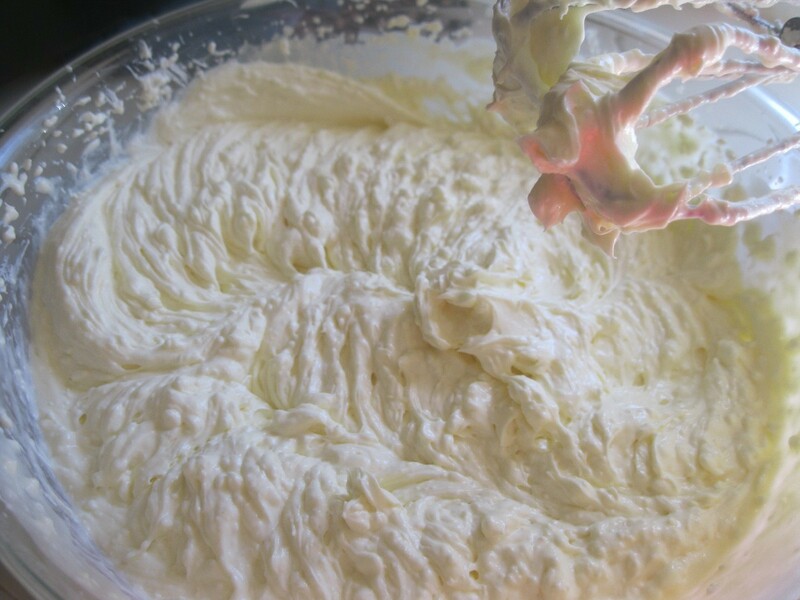 In a medium sized bowl, beat the cream cheese and butter until smooth and creamy. 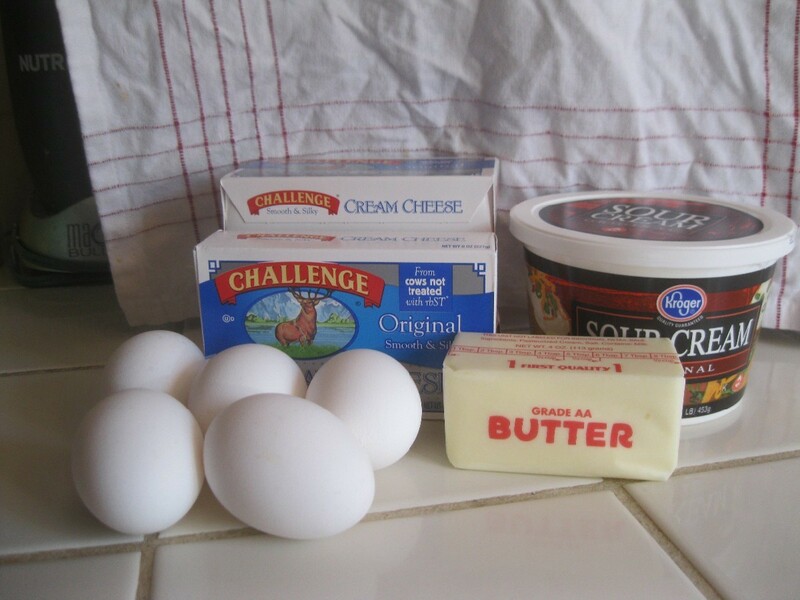 Add this to the egg and sour cream mixture and beat until smooth. 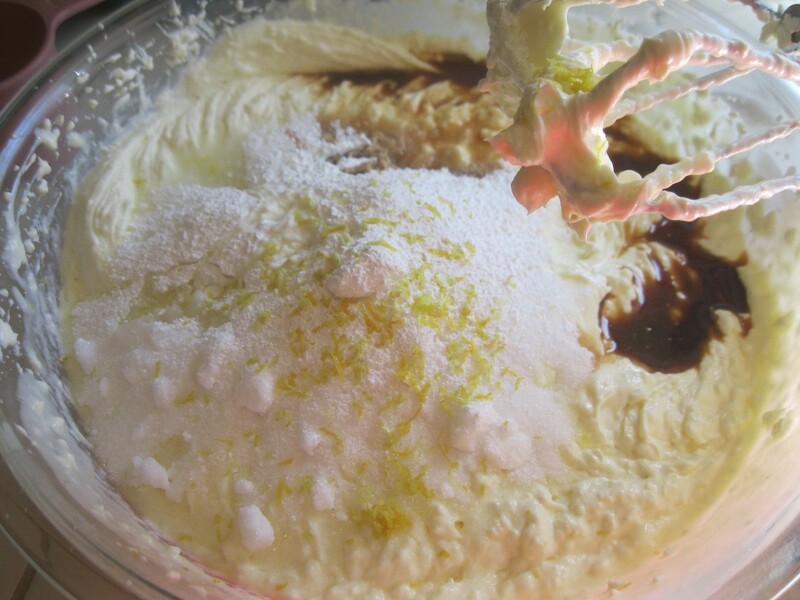 Add the sugar, cornstarch, vanilla, lemon juice and zest. Beat thoroughly, about 2 minutes. Pour into the prepared springform pan. Place in a roasting pan or other pan that is large enough to prevent the sides of the springform pan from touching. 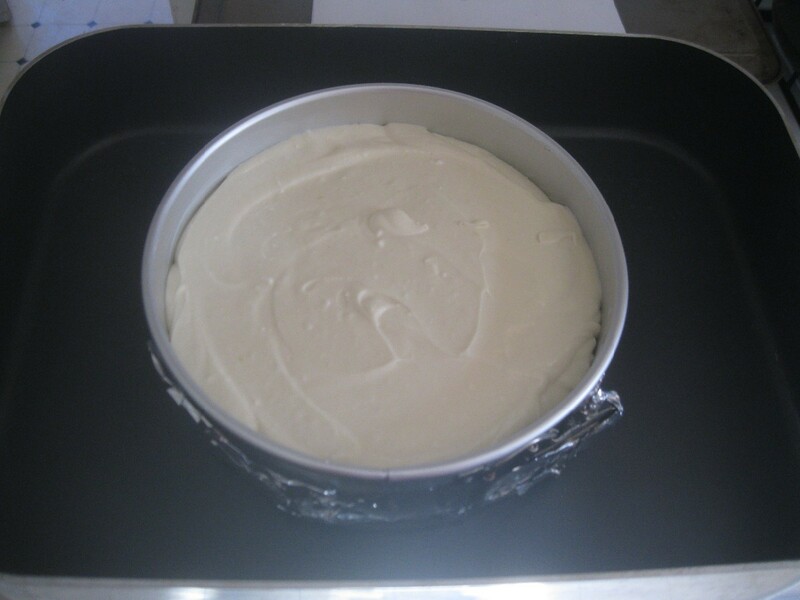 Place in the oven and very carefully pour enough hot tap water to go halfway up the sides of the springform pan. 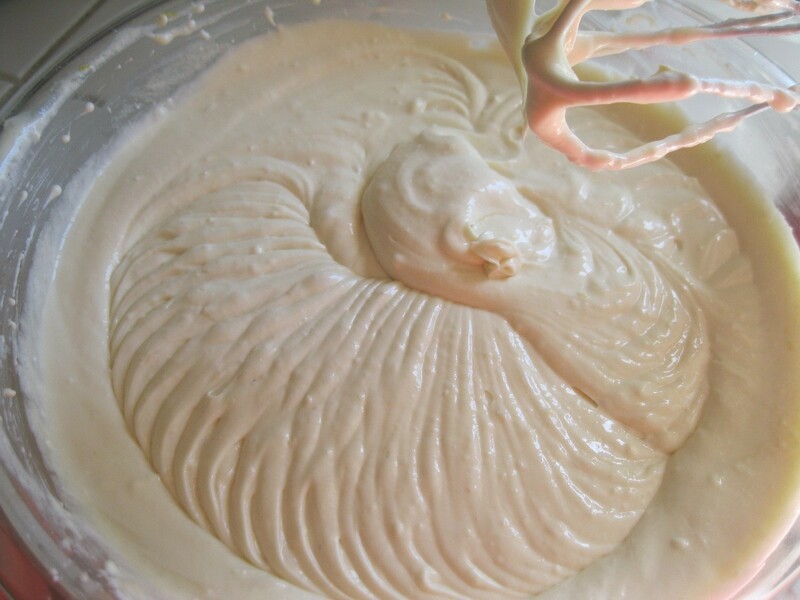 Bake for 2 hours and 15 minutes, until the cake is lightly colored and a knife inserted in the center comes out clean. Very carefully take out the roasting pan....you don't want to splash hot water onto your delicious cheesecake and you certainly don't want it to splash on you! I moved mine to the top of the stove. Carefully remove the cheesecake from the water bath. 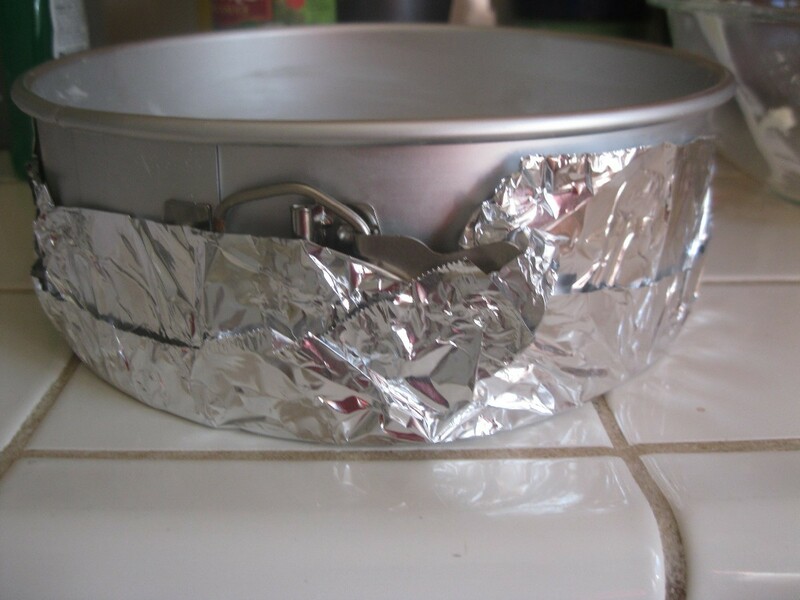 Peel the aluminum foil off of the pan. Be careful...there could be hot water in those layers. 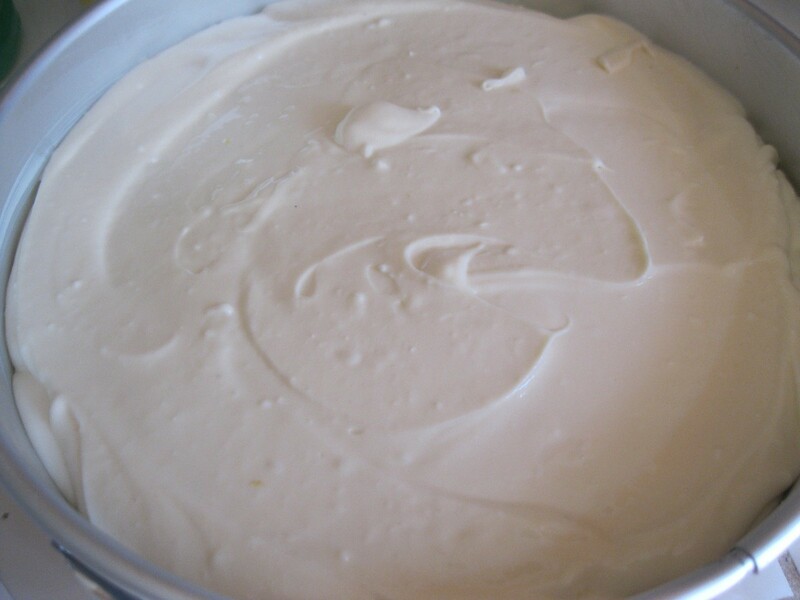 Let cheesecake stand at room temperature until completely cool, about 4 hours. Refrigerate, covered, until chilled, overnight. I know it's tempting to dig in sooner, but be patient! 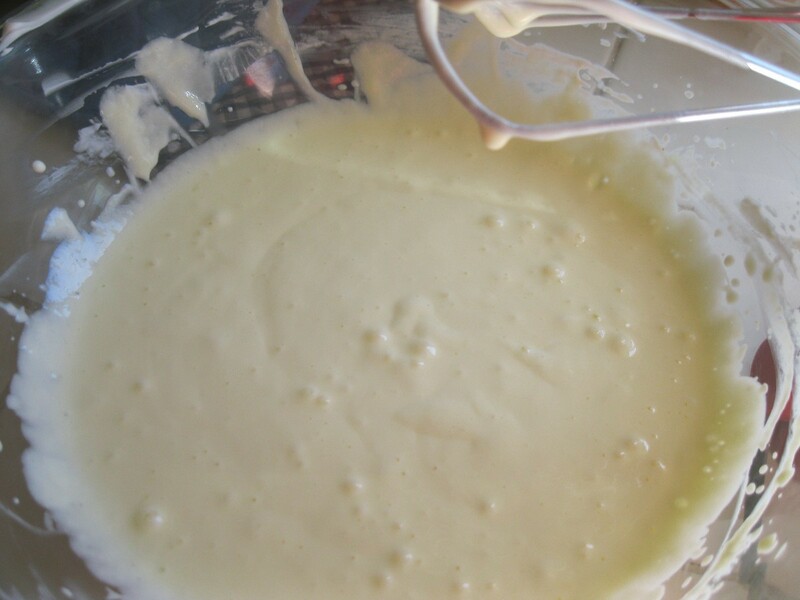 Awesome recipe: ) I love cheesecake, and this one sounds really good!